This is a short paper, that ties up the loose ends of a previous HCI paper. EDIT 12/09/13: I’ve posted a link to my copy of the PDF, and it’s also in open-access on the KAR (my university’s institutional repository). ACM and BCS links will (presumably) follow once available. 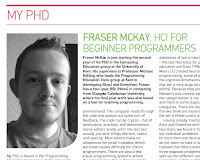 McKay, F. Work-in-Progress: Design of a Beginners’ Programming Language with a Focus on Novel Interaction Techniques. 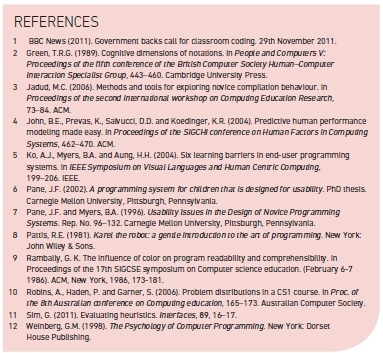 Doctoral consortium, Psychology of Programming Interest Group. (York, September 6-8th). 2011. [Google Docs]. This month, I also passed the viva based on my minithesis, which includes detailed reviews of the evidence we use in support of the new heuristics, mentioned only briefly in the PPIG paper.